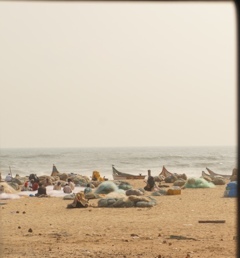 Mamallapuram rocks. Shame about the bugs. We don’t officially stop in Chennai, it’s just a stepping stone on the way to Mahabalipuram/Mamallapuram (take your pick, same man different haircut). 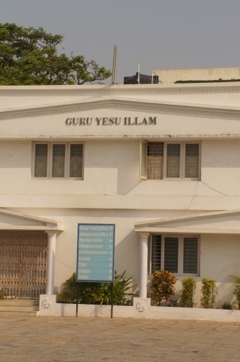 But we arrive on the train at the crack of dawn and, after a quick Indian-style breakfast at a diner that has all the ambience of Denny’s (but with the added bonus of a unisex bathroom swarming with mosquitoes), there is time for a short diversion. The little bus takes us through the city, which seems to be lined with political hoardings – mainly the chief minister and another fellow in her party with large thick dark glasses. We cruise along Marine Drive, where the Indian Ocean is pounding against a white sand beach lined with fishermen and small shacks. Across the beach there is an ugly, dilapidated apartment block, built to rehouse some of the inhabitants of these dwellings, much to the disappointment (apparently) of the owners of the posh apartments directly behind it, who object to this alteration to their sea view. We park a little way along the beach and climb some steps towards a white church, the cathedral of St Thomas the apostle, whose remains are, apparently, entombed in a crypt below the altar. There is a small museum of relics and other artefacts, and downstairs is the tomb itself, which is approached through an anteroom with an alarmingly garish plaster representation of the moment of St Thomas’s martyrdom. The tomb itself is also topped with a robed mannequin of dubious vintage, giving the room the unfortunate air of a slightly dodgy provincial museum. 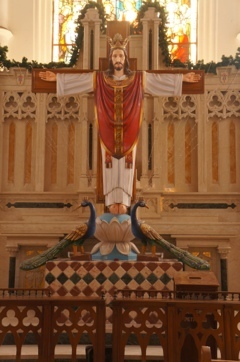 The cathedral itself is much more impressive – the first time I have seen a statue of Jesus standing on a lotus flower, in the manner of other Indian deities. We return to the bus and continue on to Mamallapuram, along a coastal road littered with hotels, resorts (hotels with a driveway and a fence) and advertisements for amusement parks. The hotel in Mamallapuram is my favourite so far – they even have a swimming pool! And a swimming pool attendant, complete with register, who ensures that one signs in, takes a token shower, and – after a blissful dip in the crystal clear pool – signs out again and leaves an appropriate comment in the pool’s visitors book. Really. 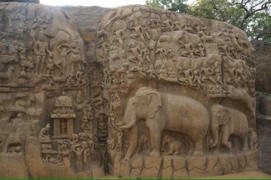 Mamallapuram is a touristy little town, known for its monolithic rock carvings. They’re on a much smaller scale than the ones at Ajanta and Ellora, but impressive all the same. Of particular note is the massive wall frieze known as Arjuna’s Penance, carved in amazing detail – the waterfall must look fantastic during the monsoon. 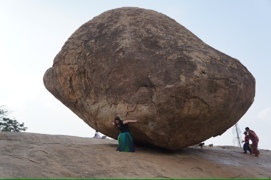 And it’s hard to miss Krishna’s butterball, the huge boulder improbably balanced on the edge of the rock face. There’s also a small cave temple containing a statue of Brahma, no longer in use – the only active Brahma temple in India, I’m told, is the one in Pushkar, which I will see in a few weeks from now. A few minutes away on the edge of the sea lies the ancient Shore Temple, its pillars and carvings eroded by the salt from the pounding tides and the occasional flood. Nearby there is a government shop selling crafts from throughout the region. I have been searching for a small figurine of Saraswati, goddess of knowledge, and here I find an intricately carved wooden version. The initial price is astronomical, so I make my apologies and start to walk out. The salesman asks what I could pay, and I reluctantly name a price half that of what he had started with. A few minutes later he agrees, making me suspect I could have started even lower! I have a long tradition of buying completely inappropriate souvenirs when I’m in the middle of a long trip (somewhere in my parents’ garage in New Zealand lie the coffee cups that I carefully carried in my pack all the way home from Prague). At least the statue weighs only a few grams, though getting it back to London in one piece two months from now is going to be a challenge! 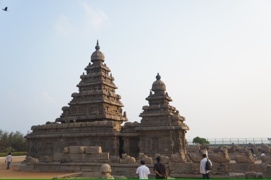 The only downside to Mamallapuram that I can see is the disproportionate number of super-persistent touts – in a small place it is even more noticeable, and definitely makes me think twice before I so much as glance at anything in the shops that I pass. There are the usual shops selling sarongs and trinkets, but also a number of stone-carving galleries and workshops. I don’t have time to make it down to the beach, except to see the shore temple, and I could stay a little longer here, if not for the touts. It would be good to have just a little more time to explore. We have dinner that night at a seafood place along the path to the beach. Before dinner, the day’s catch is presented to us for selection, and I settle for giant king prawns, which come with a fiery chilli sauce. After dinner I stop at the little tailor’s shop across the road from the hotel – some of the others are already sporting smart new salwar kameez for which they were measured on our arrival only a few hours before, and I’m hoping he might be able to make some new trousers to replace the pair I bought in Goa (which have not held up well to regular use). 900 rupees later my last-minute order is placed, the old trousers left with the tailor by way of pattern, and I’m in a rickshaw on the way to meet the others at a cafe which, Charles has promised, serves the most incredible chocolate brownies. I smile wryly when I realise he has directed us to the local branch of Cafe Coffee Day, but I have to admit that the brownies are pretty good. We walk back from the cafe, ignoring the occasional seedy comment from the few Indian guys wandering past in the other direction. Back at the hotel, the tailor sees us arrive and hurries across the road – my new trousers are ready, and he has even managed to repair the ripped ones. Not bad for two hours’ notice. I have managed to rig my mosquito net in the hotel room, and am sleepily updating my journal by the light of my headlamp, when I notice a little brown beetle has slipped under the net. Looking down, I notice another. Then another – until I realise with absolute horror that the bed is literally crawling with bedbugs – and judging by the state of them, I have been bitten already. I shake my roommate awake, leave her to gather up her things, and storm downstairs to reception, brandishing my pillow and its telltale little bloodstains as evidence. It takes a little convincing before the night manager realises that we are not, in fact, going to be happy to spend the night in the same room as the bugs. He acts as if he is doing us a huge favour – “upgrading” is mentioned. There’s no discernible difference that I can see between the rooms, but as long as the new one is clean, I don’t care. It takes a while to get back to sleep, and in the morning my worst fears are confirmed: I am covered in nasty red bites, and they are itching like crazy. The problem with bedbugs is that they are really good at hiding, and they can survive without feeding for as much as a year. Consulting the oracle (i.e. Google), it seems the options are submersion in boiling water or prolonged exposure to direct sunlight. I have a spare vacuum-sealed plastic bag, so we add suffocation to the mix and tie the sealed bag to the roof of the bus for the morning’s journey to Pondicherry, hoping the next hotel can procure some boiling water as well. As we are leaving the hotel, we spy our mattresses and bedclothes being laid out in the sun on the roof of the hotel, and cleaners are scrubbing the room – nobody else’s room was infested, so hopefully it was an aberration and the next guests in that room won’t be bitten. Eew!! Oh happy bugs – sated for another year at the very least.